Not sure how many of you have been aware of this, but Java upgrades over the past several years have been problematic for Windows users. When a new version of Java came out, the installer would prompt you to upgrade, but would never prompt you to remove the old version, or do it for you. In my work, I’d see computers with as many as 10-12 different versions of Java on them. The user, unaware of the messiness built into the Java upgrade, would leave the old versions on their machine, and they’d keep piling up. You could see them in the Add/Remove Control Panel, but how many people know how to look there, and how many know that it’s okay to remove old versions of Java? 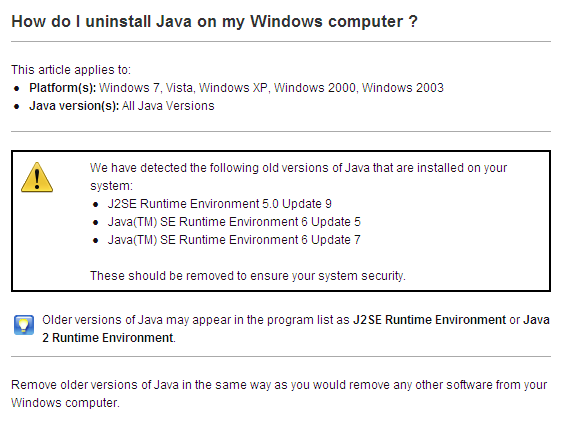 So I was heartened to see that Java is finally acknowledging the problem with old Java versions sitting on Windows machines, and is now prompting users to remove them after installing the new version. See the screenshot below. Ideally, their upgrade engine ought to remove them for the user, but at least this is a step in the right direction. And to think that Java is being used everywhere these days (even where you don’t want it), and it took all this time for them to straighten out the upgrade issues. It’s a bit shameful if you ask me.